Plot 10, The Pentlow, is a three bedroom detached house with garage and parking. Living Room - 5.572m x 3.310m 18'3" x 10'10"
Kitchen / Dining Room - 5.572m x 2.950m 18'3" x 9'8"
Utility Room - 2.200m x 1.950m 7'2" x 6'4"
Master Bedroom - 3.420m x 3.375m 11'2" x 11'0"
Bedroom 2 - 3.375m x 3.005m 11'0" x 9'10"
Bedroom 3 - 3.060m x 2.103m 10'0" x 6'10"
Hopkins Homes properties are crafted to the highest standards by our team of skilled tradesmen using cutting-edge technology and materials. Hopkins Homes are multi award-winning house builders known for creating exceptional properties of the highest quality throughout the East of England. The stylish homes at Weaver's Tye are no exception; these are homes designed to meet the balanced needs of a modern lifestyle. 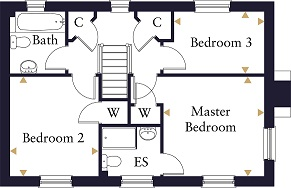 Weaver's Tye offers a selection of thoughtfully designed properties, consisting of 1 & 2 bedroom cottages, 2 & 3 bedroom bungalows and 3 & 4 bedroom family homes. With 13 exciting designs available, there are styles and sizes to suit a wide range of buyers and individual tastes. At Weaver's Tye the homes have been built with their surroundings in mind, complementing and enhancing the local area. What's more, the properties have been built to stand the test of time, creating homes that can be enjoyed by generations to come. Recently voted within the top 10 most beautiful places to live in Suffolk, Long Melford is an ancient village surrounded by an abundance of rolling fields set beneath the huge skies that make up the Suffolk landscape; famously captured by local artists Thomas Gainsborough and John Constable. With much to offer including stunning historic architecture, independent boutiques, fine dining alongside art and antiques, Long Melford provides the perfect setting for exceptional country living. At Weaver's Tye you are only a 15 minute walk from the village centre which more than caters for day to day needs including a butchers, doctors surgery, pharmacy and local convenience stores. The nearby market town of Sudbury is just over 2 miles away and provides a wider range of facilities including Waitrose and Tesco, Winch & Blatch department store and a twice weekly market for fresh local produce. Long Melford has a choice of local schools including Woodhall Primary School in Sudbury as well as Wells Hall Primary School and Acton CoE Primary School. For older children there are two secondary schools with sixth forms in Sudbury: Ormiston Sudbury Academy and Thomas Gainsborough School. For higher education, there is the choice of West Suffolk College in Bury St Edmunds, the University of Colchester and the University of Suffolk in Ipswich, all within 20 miles. Long Melford is also perfectly positioned for commuting to the major nearby towns or the many commercial and science enterprises that are available within the City of Cambridge approximately 40 miles away. You will be spoilt for choice with the excellent range of eateries within the village, with restaurants, hotels, pubs and tea shops all offering individual specialities. For fine dining, Scutchers is an award-winning restaurant offering superb seasonal menus or, if you prefer something more traditional, The Bull, The Crown and The Swan all offer high end 'pub-grub' of a superb standard. For an active lifestyle the Kingfisher Leisure Centre in Sudbury has a swimming pool, spa and gym and offers numerous classes whilst the sports clubs available include rugby, football, cricket and rowing. Given the countryside location, it's not surprising that there are numerous footpaths and bridle paths for the walkers, runners and riders and all just minutes from Weaver's Tye. Long Melford is ideally located with good transport links to the A14 at Bury St Edmunds where you can head west to Cambridge, east to Ipswich or south to the A12 linking you to Colchester and the mainline rail stations offering a direct service to London Liverpool Street. For travel further afield Stansted Airport is just a 36 mile drive. *Choice available subject to stage of construction. This specification is only meant as a guide, some items may vary from plot to plot. Please check with Sales Consultant for further details. It is not possible in a brochure of this nature to do more than give a general impression of the range, quality and variety of the homes we have on offer. 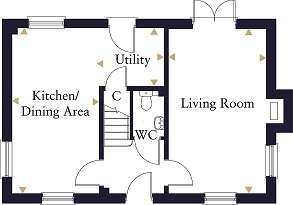 The computer generated imagery,floor plans, configurations and layouts are included for guidance only. The Properties may vary in terms of elevational design details, position/size of garage and materials used. Such changes are due to our commitment to creating homes of individual character, although similar to others. We operate a policy of continuous product development so there may be material differences between the accommodation depicted in our literature and that on offer on any particular development or at different times during the progress of any development. Maps not to scale. Computer generated images of property types at Weaver's Tye may not necessarily illustrate that property type in its setting at this development. All internal and external photography of properties depicts previous Hopkins Homes and Hopkins & Moore developments. Other photographs are of the local area or are indicative lifestyle images. All details are correct at time of printing. Designed and produced by Trident Marketing Anglia Ltd 01473 823700 www.tridentmarketinguk.com. Disclaimer - Property reference 100098007093. The information displayed about this property comprises a property advertisement. Rightmove.co.uk makes no warranty as to the accuracy or completeness of the advertisement or any linked or associated information, and Rightmove has no control over the content. This property advertisement does not constitute property particulars. The information is provided and maintained by Clarke & Simpson, Framlingham. Please contact the selling agent or developer directly to obtain any information which may be available under the terms of The Energy Performance of Buildings (Certificates and Inspections) (England and Wales) Regulations 2007 or the Home Report if in relation to a residential property in Scotland.